Many of today’s hottest new enterprise technologies are centered around free, “open-source” technology. As a result, many big companies — from financial giants to retailers to services firms — are building their businesses around new, community-based technology that represents a sea change from the IT practices of the past. But how can corporate customers — and investors — evaluate all these new open-source offerings? How can they tell which projects (often strangely named: Ansible, Vagrant, Gradle) are generating the most customer traction? Which ones have the biggest followings among software developers, and the most potential to capture market share? That’s why we decided to create a new, detailed index to track popular open-source software projects, and gain some insights into the new companies powered by these technologies. It is the Battery Open-Source Software Index (BOSS Index), which we’ve spent months putting together with publicly available information and are introducing here. We hope to update it quarterly — and the index should gain more relevance as more open-source companies using some of these projects grow and go public. We focused on projects in enterprise IT-related areas like IT operations, including technology powering operating and provisioning systems; data and analytics, including tools for artificial intelligence and machine learning as well as databases; and DevOps, which includes projects focused on the hot new trend of “containers,” which help people develop software quickly in a sort of self-contained environment. But some more-obscure names, like Selenium, also rank highly, indicating there is plenty of grassroots innovation happening in the open-source sector — and many new projects out there that are spawning valuable companies. Still, our research also found that having lots of users for your open-source project does not automatically translate into creating a commercially viable company. Impact in the open-source community, tracked by measuring a project’s influence on GitHub. Specifically we tracked the number of “forks,” or extensions, built on each project; the number of GitHub “stars” a company received, indicating its popularity; and the number of “watches,” another popularity indicator, all as of February 9, 2017. Even so, there’s always room for improvement. Some adoption and popularity criteria, such as download metrics, are obviously somewhat difficult to measure, and surely we haven’t captured all the hottest, new emerging tools. Though with our planned quarterly updates, we should be able to track new leaders as they emerge. So we’d love feedback from the community to improve our numbers, and the index, over time. Please let us know at opensource@battery.com if you have further insights into any of these metrics. Git, which came in at No. 2 on the list, inspired GitHub and GitLab. The wildly popular open-source project serves as a “version-control system” for tracking changes and coordinating work between software developers. Also high on the list, at No. 3, was MySQL, the database technology first developed in 1995. MySQL currently helps run huge, Web-scale companies like Google, Facebook and Twitter. But it’s also worth noting that several “NoSQL” database technologies — which are non-relational databases, unlike MySQL, and are often better suited for parsing the unstructured data being thrown off by many companies today — also ranked highly. MongoDB raised a new round of financing in late 2015 — the company is estimated to be valued at around $1.5 billion — and now competes against established database players like Oracle, IBM and Microsoft. Overall, several of these NoSQL vendors are growing independently of one another — quite quickly in some cases — rather than converging into one giant system. This points to further fragmentation in the broader data-infrastructure sector, and could lead to the creation of several strong NoSQL players that could be public companies in the future. As many organizations struggle to manage huge volumes of structured and unstructured data today — generated by everything from security software to tweets to Web-enabled sensors in manufacturing plants — they are increasingly looking for new data-management and storage solutions. That trend is reflected in our index, as more than a dozen (15) of the 40 projects included are open-source technologies powering databases and data processing. Docker is also competing with open-source platform technologies like Google’s Kubernetes (No. 33) and Mesos to control the “orchestration” layer in software development, or the ability to manage containers across different software environments. These open-source projects are not your father’s Sun or Oracle. But as we noted earlier, having lots of users — while essential to eventually gaining commercial traction — does not guarantee that an open-source project will make a good business. That takes a lot of hard work and creativity, particularly in structuring new types of business models; leveraging complicated open-source licenses; and tweaking traditional enterprise-sales practices to fit an open-source product, as we discussed in TechCrunch last year. What’s more, we’ve found that the chances for commercial success for IT companies leveraging open source can sometimes increase if they offer several open-source technologies that can be used together in a sort of “stack.” Elastic has the “ELK” stack, for example, consisting of the open-source Elasticsearch (No. 7 in our index), Kibana (No. 36) and Logstash (No. 29) projects. Time-series database company InfluxData,* similarly, sells versions of the “TICK” stack — that stands for Telegraf, InfluxDB, Chronograf and Kapacitor. DevOps company HashiCorp, in one final example, has commercialized many open-source projects, including two that made our list, Vagrant (No. 15) and Vault (No. 40). Software developers like to be able to pick their favorite components from these stacks, in keeping with the “best of breed” product mentality that dominates software development today. These open-source projects are not your father’s Sun or Oracle. 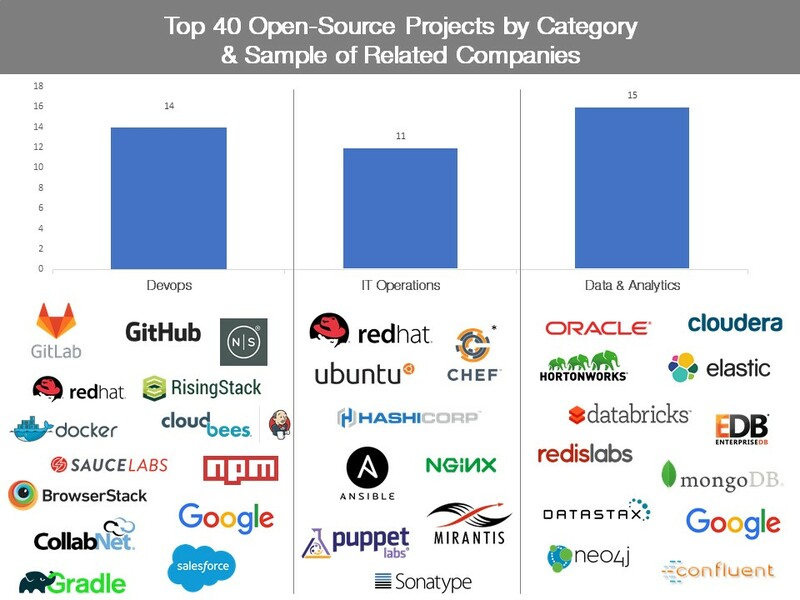 But clearly, CIOs at major global companies now rely on open-source technologies — including many of the ones highlighted in our index — to run key segments of their infrastructure, and many of these projects are going to be around for the long haul. Indeed, at an open-source summit that we hosted last year, IT executives from large companies ranging from Goldman Sachs to Capital One discussed their “open-source first” attitude when it comes to deploying new software and infrastructure. And as more open-source-based companies go public in the coming years, we’ll get even more information about how these top projects are performing, and will continue to track their progress and influence on the industry.